Torque Compensation: This feature enables the engine to maintain a consistent and stable torque level under all conditions. CRDI Diesel Engine with Daedong ECO Technology: The new Common Rail Diesel Engine (CRDI) improves fuel efficiency while reducing noise levels. With this eco-friendly Tier 4 engine, the NX series offers the operator a quiet work environment with powerful performance. Anti-Stall Function: When the "Anti-Stall function" is engaged, the tractor will protect itself from instant engine stall when there is momentary engine overload. The operator can also fix and set maximum speed limit when safe and precise working is needed. Turn Assist Control: The optional turn assist control kit will drop the engine rpm by 10% automatically when turning sharply. This feature will allow for more precise work and reduces fuel consumption during sharp turns. True Speed Cruise Control: Electronic HST control system enables the tractor to maintain a set speed no matter what the condition of the ground or load is. This is a very useful feature especially for work requiring a set speed for precise coverage or application. PTO Cruise Control: With one touch, engine speed may be set to maintain steady PTO rpm to maximize working efficiency. When engaged, the operator may manipulate the PTO rpm by simply clicking a switch. Hydraulic Independent PTO: The standard rear PTO is easily engaged by the simple push of a button. A safety interlock prevents the engine from starting when the PTO switch is left on. All models come standard with a selectable manual or automatic PTO option. When the Auto PTO is engaged, the PTO will automatically shut off when the 3-point control is raised, eliminating exposure to the running implements. Power Steering: Hydrostatic power steering minimizes the effort required to make tight, repetitive turns. The steering wheel tilts with the simple push of a lever, allowing easy adjustment to fit the operator needs. Ergonomic Joystick Lever: An ergonomically designed joystick lever for front loader operation is standard on NX series tractors. Advanced Air Conditioning System: The improved Cooling and Heating system will ensure comfortable working conditions for the operator year round. Window Wiper: The standard window wiper (rear optional) improves visibility and keeps the window free from rain and dust. Panoramic View: The comfortable cab with upgraded interior minimizes operator fatigue even after a long work day. The improved wiper position maintains a clear view for the operator. Front End Loaders : KL6010: Fits the NX4510/5010/5510/6010 models. 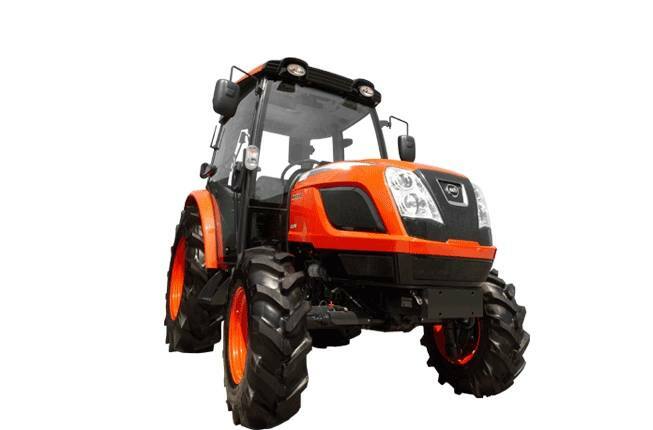 The KIOTI KL6010 front end loader is specifically designed for the NX Series tractors, providing efficient performance with single lever joystick control. The KIOTI loader, with a built-in parking stand, is designed to be quickly and easily attached and detached. KL Series loaders utilize the tractor's hydraulic system, feature single-lever control with float and come with a bucket level indicator. *Specifications may vary with tractor model, front axle configurations, tire size option and type of attachment and are subject to change without notification. Snow Removal : SB72: Fits KIOTI DK40SE, DK45SE, DK50SE and NX tractors. Specifications and design are subject to change without notification.